This was the perfect size to go under my sewing table. I also love the color so much better than brown or white. I don't like the plastic ones so this is much better. Just wish it was a bit sturdier. Honey-Can-Do OFC-03715 3-Drawer Wheeled Chest, White/Black. 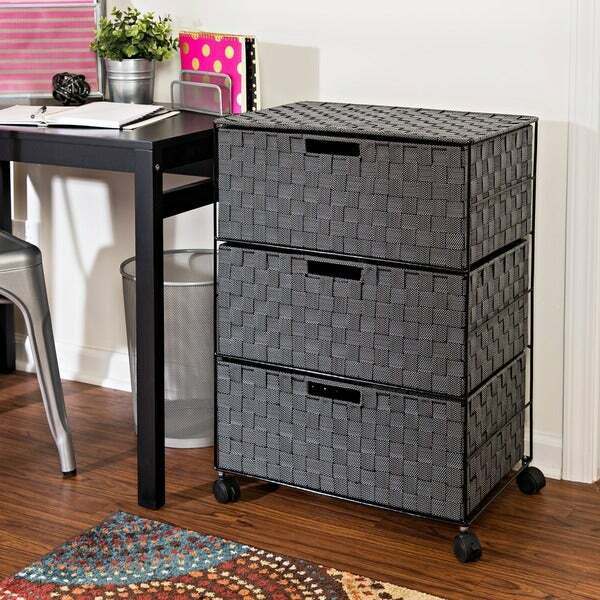 Getting organized has never looked better with this impressive double woven chest. This storage unit has three spacious drawers with handles to hold clothes, tools, office supplies or anything else that needs tucked away. Smooth rolling casters make moving the chest a breeze, and a soft top surface provides even more storage space. Coordinates with other pieces in Honey-Can-Do's collection of double woven products. This is surprisingly sturdy with drawers bigger than I thought they would be. They are perfect for my socks and t-shirts. The chest looks like it will hold up well even with frequent usage. This chest was just perfect. I was looking for something simple, and this unit is not only lightweight and transportable but doesn't require any assembly. I like it so much I ended up buying a second one! These drawers hold quite a bit. Would be good to store sweaters, extra blankets, anything that you want to keep within reach but out the way. Don't depend on the wheels, they don't function well. Very pleased with this item. It is well-made, sturdy, and looks nice. I'm using it in my smaller bathroom. I would highly recommend this product. They come pretty well assembled when they arrive. They are way more sturdy than I anticipated and they are not cheap looking at all! I purchased two and I would purchase again! Really a great item to have in guest room. I use it for my grandsons play room. "Do the drawers open and close easily after they are filled with clothes?" "What are the dimensions of one drawer?" The drawer dimensions on this item are 19.5 in L x 13 in W x 8 in H.